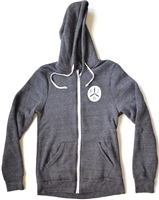 Thin hoodie, print on front and back. Very comfortable MBB long sleeve pullover. Very soft, great for a spring or fall day! A Toledo tradition since 1920! Classic Rudy's Hot Dog hoodie sweatshirt with the logo on the front, and "King of the Dogs" on the back. Very comfortable! AWESOME hoodie from The Flying Joe Coffee Shop. Seriously comfortable and looks great with a Flying Joe Coffee mug!